Silex spring at Yellowstone National Park. With its rushing rivers, sprawling canyons, and lush forests, Yellowstone National Park is an absolute treasure, but buried deep beneath its picturesque surface lies a hell that’s just waiting to be unleashed. Using computer models, researchers have simulated the conditions beneath North America’s largest supervolcano—discovering a zone that may control the movement of magma flowing out from the Earth’s mantle. A huge reservoir of magma lurks beneath Yellowstone National Park, but it’s been 630,000 years since this hidden supervolcano experienced a supereruption, and 70,000 years since its last major lava spill. Scientists aren’t sure if and when the next eruption will occur, but should it happen, lava would pour out from the Yellowstone caldera and cover an area extending for 30 to 40 miles. New research published this week in Geophysical Research Letters furthers our understanding of the magma bodies located below Yellowstone National Park, and how this extensive lava-filled plumbing system actually works. Using computer models, a team led by University of Oregon geologist Dylan P. Colón uncovered a previously undetected crustal transition zone that could tell us how the magma located deep beneath the surface creeps up and spills onto the surface. The new research doesn’t tell us when the next eruption might happen, but it’s definitely a step in that direction. At Yellowstone, a thin layer of crust is all that separates us from the boiling evil below. Occasionally, this crust is warmed and softened by the magma, allowing the lava to flow up from a giant fissure called a mantle plume. In 2014, researchers used seismic waves to detect a large magma body in the upper crust, but because copious amounts of carbon dioxide and helium were leaking from the ground, scientists figured more magma was located further down. This assumption was proven correct in 2015 when researchers, also using seismic waves, found a larger body of magma at depths reaching 12 to 27 miles (20 to 45 km). As important as these findings were, they didn’t tell geologists very much about the composition, state, and quantity of magma that was packed within these pockets, or how they formed. To fill this gap in our understanding, Colón devised computer simulations based on this data to visualize the processes going on beneath Yellowstone. Specifically, the researchers sought to determine where the magma was most likely to accumulate within the crust. According to the model—and it’s important to remember that it’s just a model—opposing geological forces are pressing against each other at depths of three to six miles (five to 10 km). This is creating a transition zone where cold, stable rocks are giving way to the hot, partially molten rocks below. This transition zone, dubbed a “mid-crustal sill” is trapping the rising magma, causing it to collect and solidify in a large horizontal area. Models suggest this sill is about nine miles (15 km) thick. Happily, the simulation meshes well with the seismic data collected in 2014 and 2015, which suggests the models are reasonable approximations of the real world. The findings also show that the sill is primarily comprised of rock that formed from cooled magma, and that the magma bodies exist both above and below it. The one above contains gas-rich rhyolitic magma, which occasionally erupts to the surface. 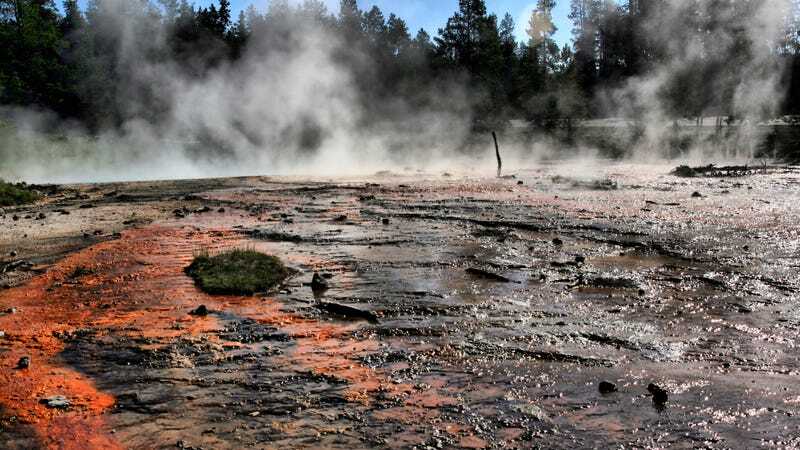 Scientists still don’t know when Yellowstone will erupt again, but we now have a better explanation for the magmatic system responsible for these eruptions. Specifically, we now know where the eruptible magma comes from and where it collects. Similar processes may be happening elsewhere, and the challenge now is see how these systems might compare. We can’t predict eruptions, but advances such as these means we may eventually get there.